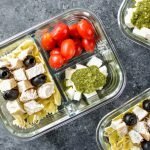 Picture this: Lunchable meets Pesto Pasta Salad! 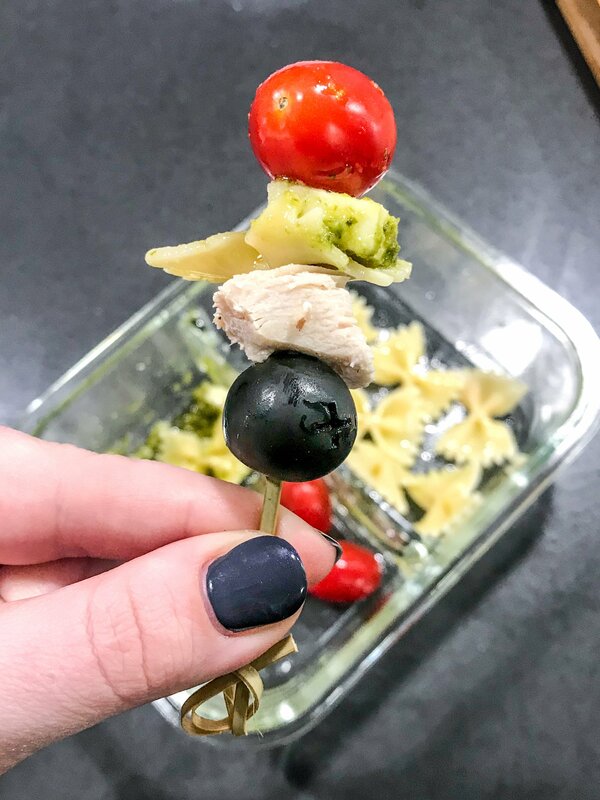 Get creative and craft your own bites of pasta salad with traditional pesto, fresh mozzarella, grape tomatoes, chicken breast, black olives, and bowtie pasta in this DIY Chicken Pesto Pasta Skewers Meal Prep! Store-Bought Vs. Homemade Pesto: Which is Cheaper? WOAH. This list is getting long. I should probably write an article about all the things to make when you buy a Costco sized amount of pesto… Coming soon! Seriously though, it’s the perfect time to meal prep pesto pasta salad. It’s a cold lunch (since pesto + microwave don’t get along), it’s EASY, it’s delicious, and I’ve never seen anyone upset about having to eat pesto pasta. However, I wanted to get a little creative with this one while also limiting my actual pasta intake. 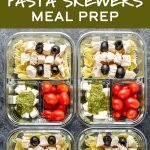 So this DIY Chicken Pesto Pasta Skewers Meal Prep was born! 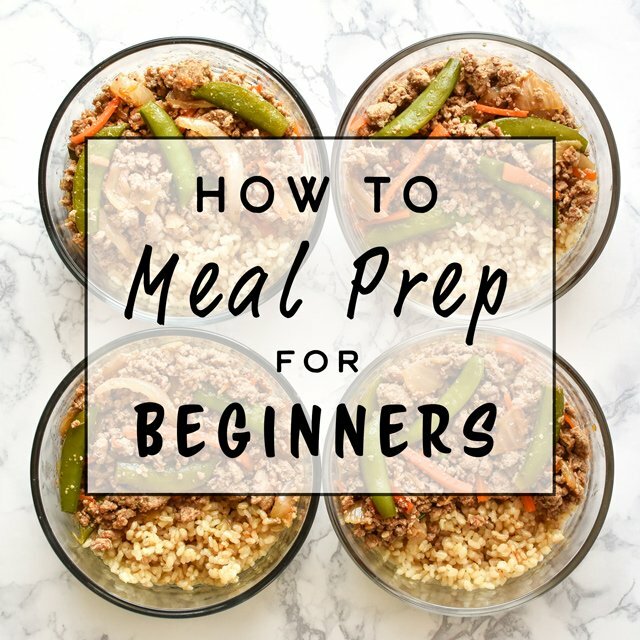 During the creation of this meal prep, I dedicated a little extra time to portioning all the components of the meal for optimum taste without eating way too much pasta along the way. I cut the amount of pasta I would normally eat per meal IN HALF, and added more tomatoes than I would normally eat to help fill me up. 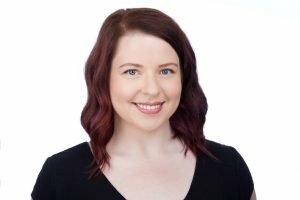 Since I spent extra time this week thinking about portions, I thought I would share examples of my thought process and steps I take when I determine my portion sizes. First, be sure to consider your own dietary needs and any nutritional guidelines you’re following. Any directions from your healthcare provider are more important than these suggestions! 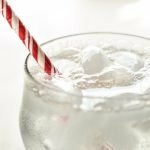 Refresh your memory on normal portion sizes for various foods, and the difference between serving size and portion size. Here’s a super handy printable guide on portion sizing from WebMD. If it’s important to you, consider how many calories you’d like to limit this entire meal to. Read the label of the item you’re trying to portion out (or do a quick Google search if there was no label). Check the serving size and calories per serving. You can always change the portion, but it’s good to know what the label says. If the container has around four servings total, evaluate how possible it would be to split the container four ways evenly (no extra food leftover!). If not, that’s okay too. If needed, weigh out one portion of the food item to see what one serving looks like and how much it actually is. This makes it easier to tell how much you’d be able to eat if it was sitting on a plate in front of you. Determine your portion size from there. Think about how much of your entire meal each item will make up, and how to stick around your calorie goal for the meal. If you notice you’re constantly having leftovers of a certain item on your plate after your meal, consider lowering your portion size next time. If you’re still hungry after your meal, consider increasing your portions of vegetables or lean meats. This might seem like a daunting list, but after you try portioning certain foods a few times, it becomes natural! You’ll quickly figure out how much of what foods you’re able to (and should) eat. 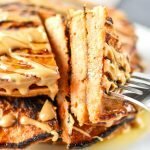 In my opinion, it’s more important to pay attention to portions of calorie dense foods like meat, cheese, nuts, grains, beans, and things like that. 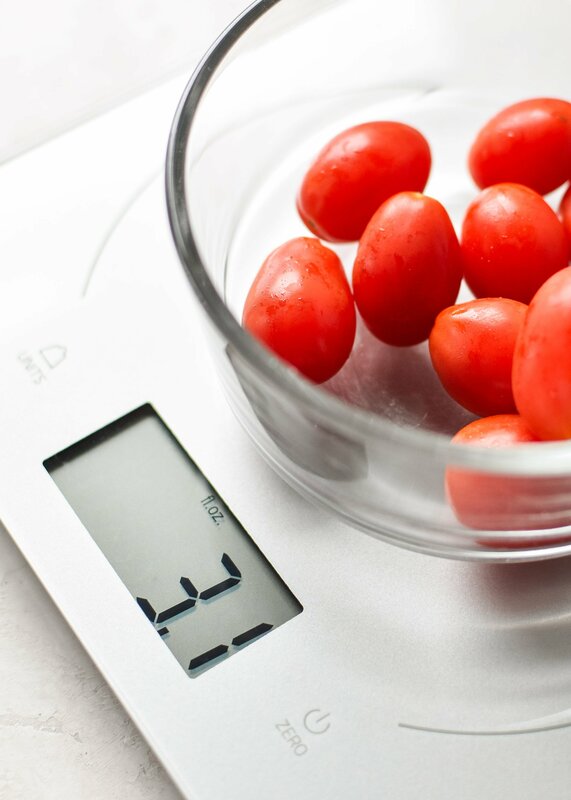 Of course this varies by specific diet, but for calorie counting purposes, it’s a bit less important to portion out most produce such as grape tomatoes, because the difference between servings is only around 10 calories. However, I do like to have an even amount in each meal, so I still weigh out the portions to ensure they’re even. The package of grape tomatoes from Trader Joe’s was 16 ounces (1 pound), so I originally planned to split this into four portions of about 4 ounces each. The plastic produce container actually didn’t have a nutrition label, but according to the Internet, 3 ounces of grape tomatoes is about 30 calories (pretty negligible to me – so it’s more about how much of these grape tomatoes I actually want to eat). I also noticed this website said that was only like 3 tomatoes, while I weighed it out to be like 12 grape tomatoes. Weighing is important! I weighed out 4 ounces of the tomatoes and decided it was more than I could eat in one sitting, so I decided to go for 3 ounce portions instead. 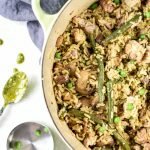 I weighed each portion using a kitchen scale (affiliate link!) and then added them to my meal prep container. I used up 12 ounces total. I decided to just go with the 1 oz package recommendation. I weighed out each portion (since I love cheese and it can get out of hand). Easy! First, I determined that my goal was to reduce a normal portion of pasta. The box says one serving of pasta is 2 ounces and 200 calories. I weighed out 2 ounces of pasta to see how much it looked like. I definitely want the pasta to be less calories of my meal, and 2 ounces is a decent amount of pasta. I decided to see what 1 ounce of pasta looks like. 1 ounce of pasta looks good for each meal and it’s only 100 calories, so I decided to go with that. I’ll need to cook 4 ounces of pasta total for the four meals. As you can see, the process can be a little different depending on the type of food item you’re portioning. With meats, I know that we like to have 5 or 6 ounces per meal, so I always start with that. After a few meal prep Sundays, you’ll develop a system that works well for you without even realizing it! I used these Bamboo Knot Skewers (affiliate link! 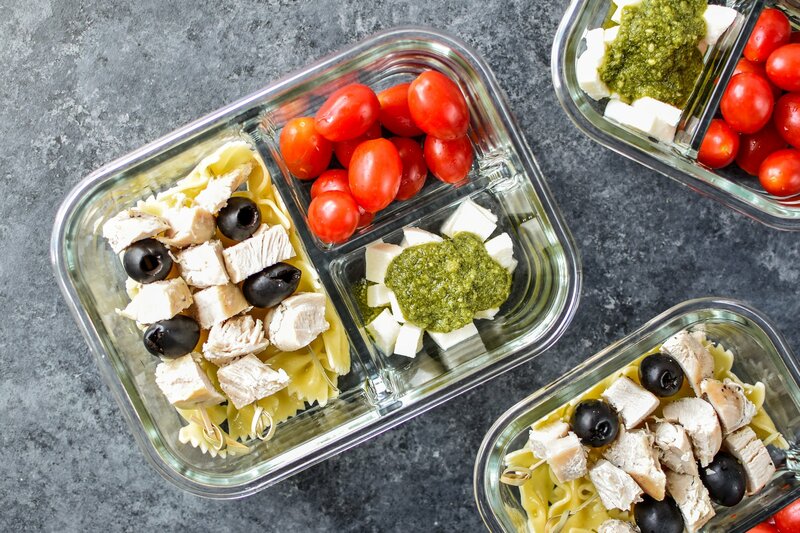 ), which are great because they do not require any soaking and fit perfectly into my 3 Compartment Glass Meal Prep Containers (affiliate link!). Please be careful if using long skewers meant for the grill (I would not recommend it). I recommend using regular white pasta, unless you are attached to a particular brand. Anytime I’ve tried pre-cooking another kind of healthier pasta, it’s severely dries out and does not taste good. I decided to limit my portion instead of suffer through dry pasta. 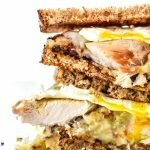 General PSA: This meal prep is for people who are trying to think outside the box of boring desk lunches. If you think this meal prep is time consuming and lame, then just make yourself one big awesome pesto pasta salad and don’t worry about letting me know. 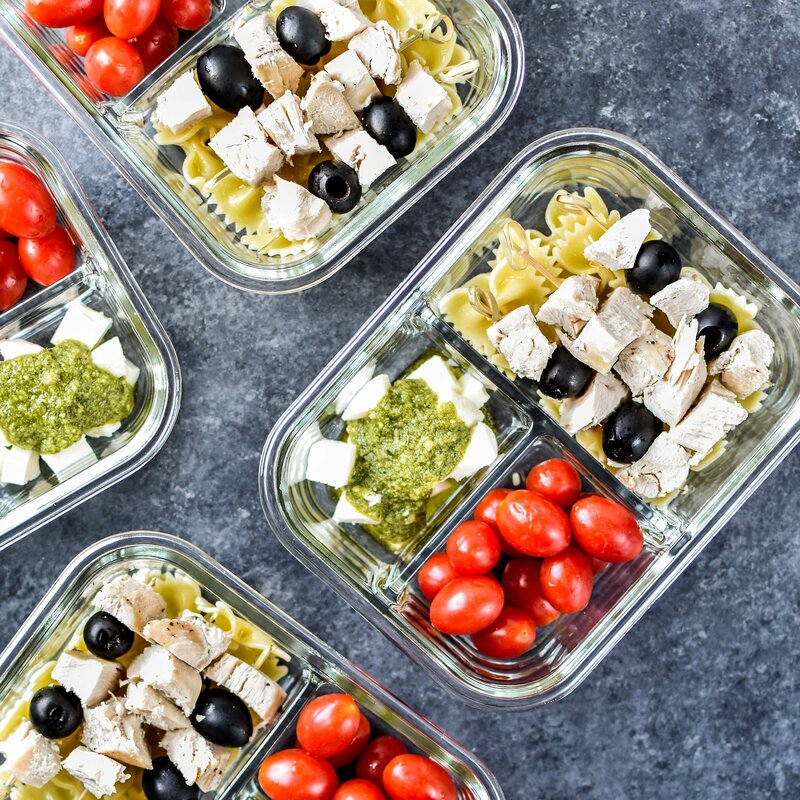 Craft your own bites of pasta salad with traditional pesto, fresh mozzarella, grape tomatoes and more in this DIY Chicken Pesto Pasta Skewers Meal Prep! Cook pasta to al dente according to package directions, seasoning the water with 1/2 teaspoon salt. Once cooked, strain and rinse noodles with cold water. Add pasta to a bowl and toss with olive oil. 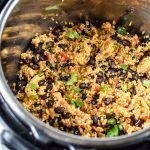 Let it cool while you assemble the rest of the meal prep. Use a scale to portion your cooked chicken breast, tomatoes, and mozzarella into four portions. Add the tomatoes to one small compartment in each container, and the mozzarella to another. Top mozzarella with 1 tablespoon pesto in each container. Portion pasta into the large compartment of each container, weighing out 1 ounce portions if you want to be precise. Add chicken pieces to skewers, alternating with olives if you prefer. Add 3-4 skewers to each meal (depending on how many you made total) on top of the pasta. If you want to skip the skewers, just toss the chicken on top of the pasta. Store in the fridge for up to 4 days. Eat it straight from the fridge! Chicken: Use leftover chicken or cook it up using any method you prefer. 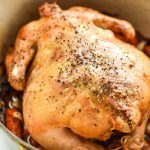 The chicken breasts pictured were cooked in the Instant Pot with 1 cup broth on high pressure for 7 minutes, seasoned with salt, pepper and garlic powder. Here’s a great oven baked method. Grilled chicken works too! Pasta: I recommend using plain regular wheat pasta for this recipe, unless you have a brand you trust. Any healthy pasta brands I’ve tried get severely dried out when stored overnight. If you’re just looking for some good old fashioned pesto pasta, try this recipe. 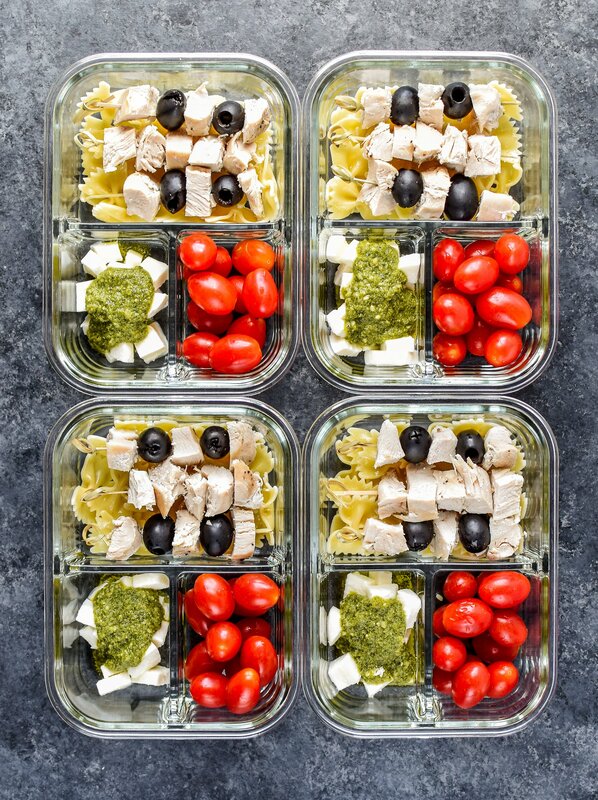 Thanks for checking out this DIY Chicken Pesto Pasta Skewers Meal Prep! Please tag me or use #projectmealplan on social media to share your skewer creations!